arkitekt vandringer: a royal day! Friday 16th April is the birthday of Margrethe 2, queen of Denmark. It cannot be compared to the queen's day in the Netherlands but still this year it was a special event since "Dronningen" turned 70. So as a loyal citizen, I went to greet our queen, with thousands of other people! Quite an atmosphere was on the central square of Amalienborg Slot. Crowned heads and architecture I would like to use the opportunity to talk about the importance some of the Danish monarchs have had on architecture and culture in CPH. Many historical buildings are linked to royal history and today they contribute to CPH's skyline. They are churches and castles. Rosenborg, the stock exchange, the round tower, among others, are due to Christian 4. It is said he emptied the city's savings but he contributed greatly to the historical heritage we can enjoy today. Those were built in the 17th century, in a late Dutch Renaissance style -typical for Danish buildings of that time and already used at Kronborg Slot, built by his dad Frederik 2, in the 16th century. Christianshavn -the harbour- was also constructed under his initiative. Nyboder -the military's housing block, with their typical yellow colour- as well. Vor Frelser kirke was inaugurated by Christian 5. Christiansborg was erected by Christian 6, as a sign of power and magnificience. Today it is the seat of the government. The royal family has moved to Amalienborg, built under the reign of Frederik 5. Amalienborg is a part of a new city part, the Frederiksstad, and the 4 rococo castles disposed around the octogonal plaza where originally conceived to host the 4 most important government officers. This answers the question: why a centered and introverted plan for a royal palace, which usually are facing the people. But Frederiksstad is more: it is also the introduction of perspectives in the city, among which one the famous Mamor kirke-Amalienborg-canal, which is closed off, since 2005, by the new opera house -designed by the Danish architect Henning Larsen. Recently one of the castles, Frederik 8's palace, has been entirely renovated in order to receive the crown prince Frederik and his family. The rococo palace with its Late Empire interieurs has been given its previous glory. Ceilings has been discovered and restaured, colours has been put back -the Empire colours appearing very trendy with pale turquoise and dark aubergine-, the columns has regained their golden touch and contemporary art has been beautifully integrated! Enough architectural talk...For those who are interested in some architectural history, I will soon come with some sight-seeing routes that allow you to see all this. 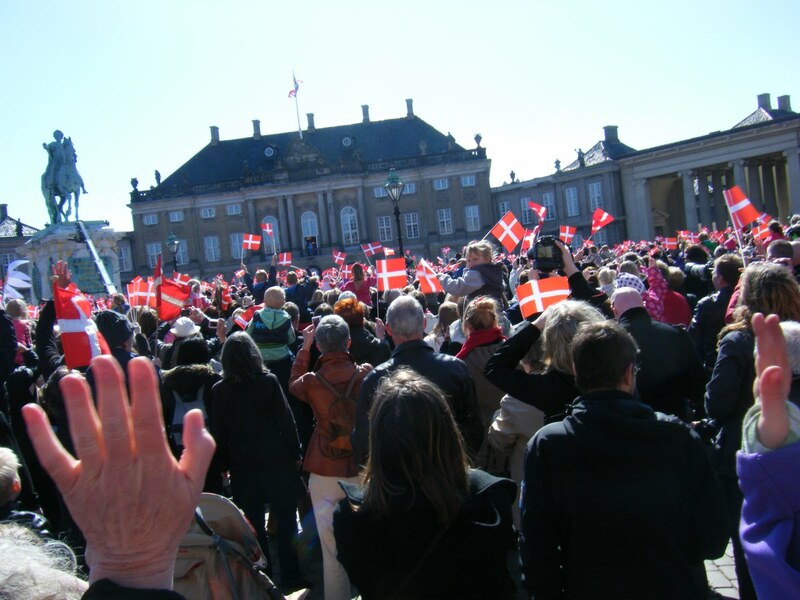 Post Scriptum: about the Danish flag and the Danish people When you come from abroad, it seems like the Danish people have a very special relation to their flag: it is not only a sign of pride and nationalism. It stands on the table for every birthday, it is held high up in every little square of garden colonies, used as decoration on birthday cards, embellishing the christmas tree...As Dane, I may not get how weird or extraordinary it might seem but, yes, it is true we like our Dannebrog.